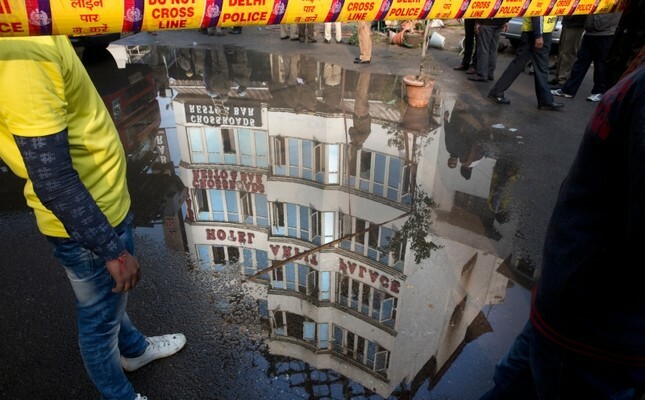 At least 17 people died on Tuesday as a fire tore through a budget hotel in New Delhi before dawn, in the latest disaster to raise concerns over fire safety in India. The fire broke out at the Hotel Arpit Palace in a congested part of central New Delhi, with images showing it engulfing the entire top floor. G.C. Misra, New Delhi fire brigade director, said the blaze had been brought under control and that 35 people were rescued by firefighters in an operation lasting several hours. "There was wooden paneling on corridors because of which people could not use corridors to evacuate," another firefighter told reporters. Images showed thick smoke and flames billowing out of the top floor of the four-story hotel, popular with budget travelers.